Sam Winston. (Unknown). New York Magazine. At: New York magazine press, New York. Sam Winston. (2005). Made up true story. [Lithographic printed]. At: Circle Press, London. Sam Winston (2005) Made up True story. [Online]. Available at: http://www.samwinston.com/editions/made-up-true-story (Accessed at: 10 March 2015). Made up True Story This design was part of a 6 page page book, text set-Times Roman and Lithographic printed on paper. I like the way the text is shaped to create pattern, an image and even a texture. It looks interesting, visually appealing and distinctive. Sam WInston. 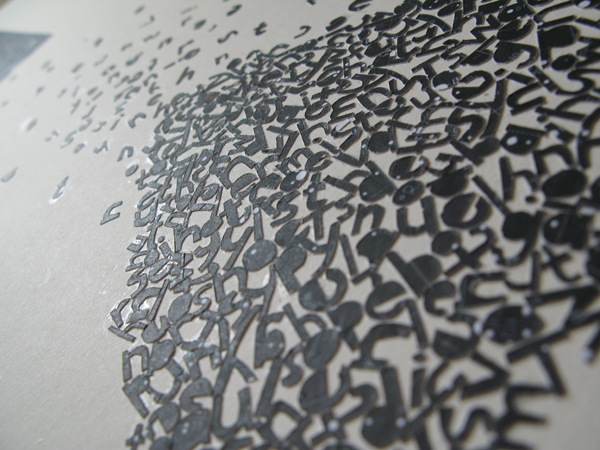 An interview with Sam Winston, a typographic artist unlike any other. [Online]. Available at: http://www.typorn.org/article/interview-sam-winston-typographic-artist-unlike-any-other (Accessed: 18 February 2015). 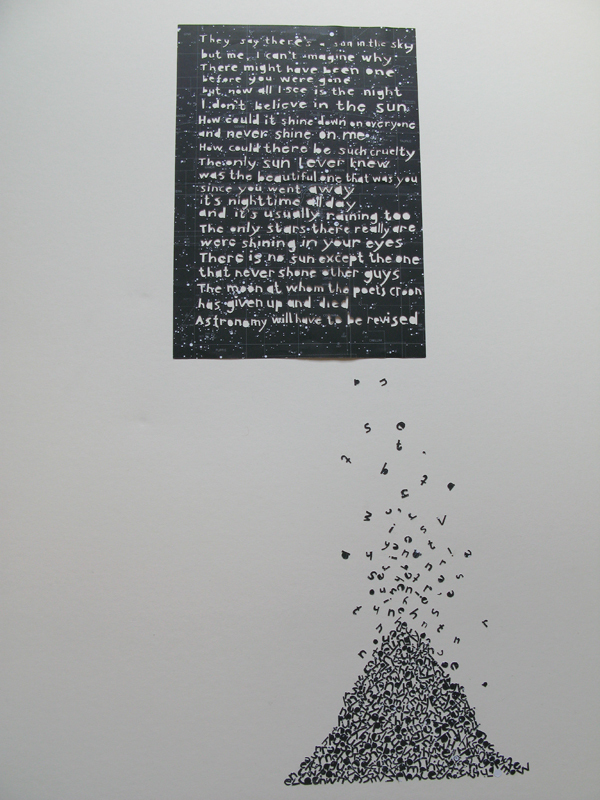 Sam winston’s work uses to type to create an image and a message. 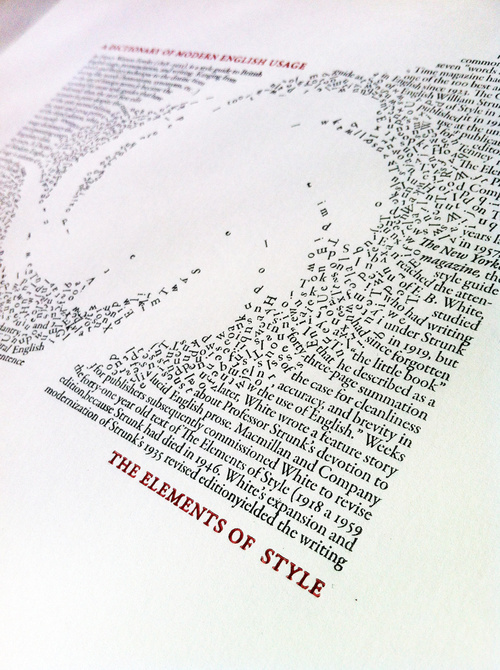 He combines playful contemporary information such as information with works such as Shakespeare and the dictionary. Winston also uses the type to story tell. The style of Sam Winston’s work has inspired me, I quite like how he uses the type in a playful way and how he creates type as an image. I also like how he creates a message using type. Some of the works of Sam Winston that I find more inspirational are shown above. He mainly uses poetry for his work. What inspires Sam Winston? After looking and researching at Sam Winston’s work, I decided to research who influences? what designers or even writers inspires him? Dom Sylvester Houedard: Cosmic typewriter Reference: Poynor, R. (2012) Dom Sylvester Houedard: Cosmic typewriter. Design observer.[Online]. 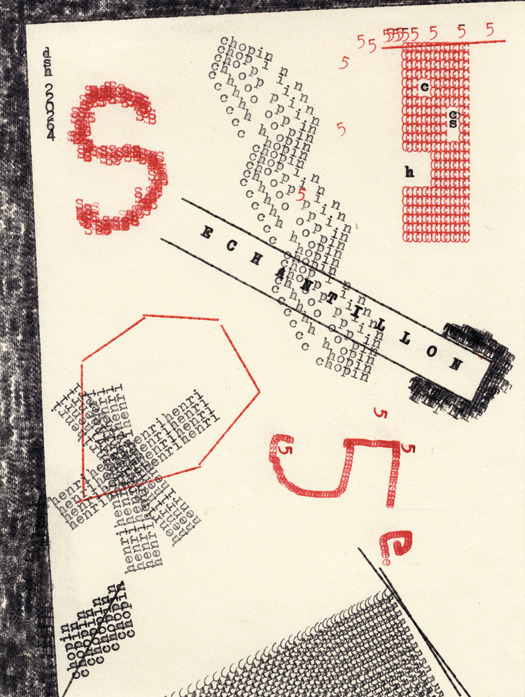 Available at: http://designobserver.com/feature/dom-sylvester-houedards-cosmic-typewriter/37577 (Accessed: 18 February 2014). Dom Sylvester Houedard. (1964) Cosmic typewriter: typestracts. [Online]. 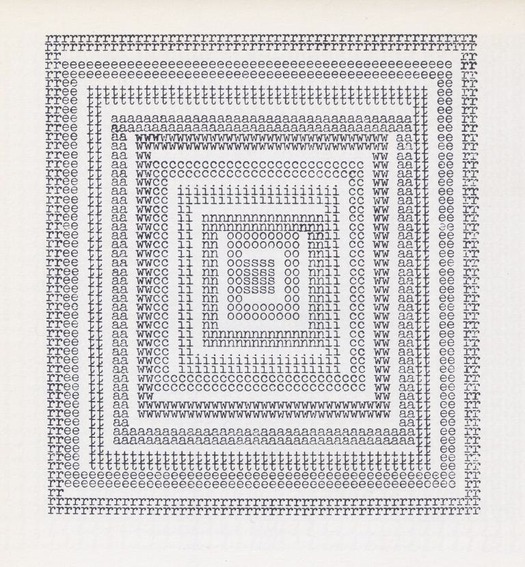 Available at: http://designobserver.com/feature/dom-sylvester-houedards-cosmic-typewriter/37577 (Accessed 18 February 2015). Dom Sylvester Houedard. (1964) Sonic Water. [Online]. Available at: http://designobserver.com/feature/dom-sylvester-houedards-cosmic-typewriter/37577 (Accessed 18 February 2015). 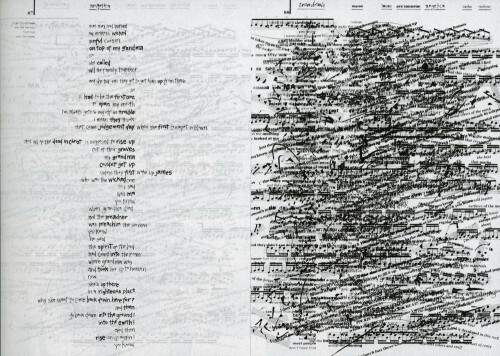 Houedard was a poet in the 1960s , he produced produced visual poems of his own, which he called “typestracts” (combining “typewriter” and “abstract”). 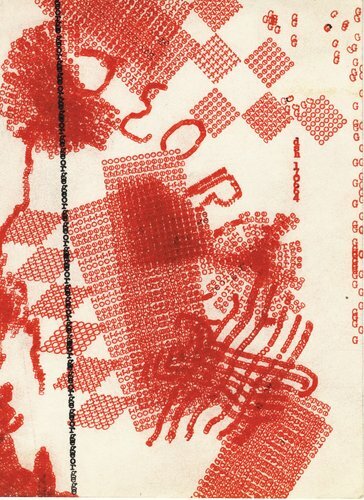 Even though this had an influence on Sam Winston’s work and style, it is quite different as in the 1960’s designers tended to use traditional media rather than digital. In Houedard’s style of work is more traditional than Sam Winston’s work that is more digital. However, they both use poetry in within their work. Houedard wrote an essay- Concrete Poetry and Ian Hamilton Finlay(poet).- Shows a written super condensed style, looks like a series of free-flowing notes, which would have been as novel for readers as the subject matter (Poynor, 2012) I quite like how Houedard’s work uses type to show an image and the letterforms of the typewriter also show and creates a pattern, which makes it look appealing. Dom Sylvester Houedard. (1964) Notes from cosmic typewriter. [Online]. Available at: http://cn.blouinartinfo.com/news/story/853729/Works-of-Dom-Sylvester-Houedard-published (Accessed 18 February 2015). Dom Sylvester Houedard. (1964) cosmic typewriter. [Online]. Available at: https://www.pinterest.com/pin/289848925987808390/ (Accessed 18 February 2015). Above is a few other pieces of artwork by Dom Sylvester Houedard. 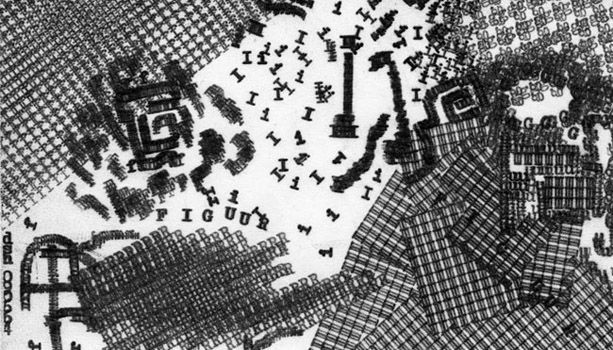 He uses a typewriter, which may sound a bit dated but it actually creates exciting, interesting patterns. I like how the letterforms are overlapping to create visually appealing designs. Words in a pattern and shape.